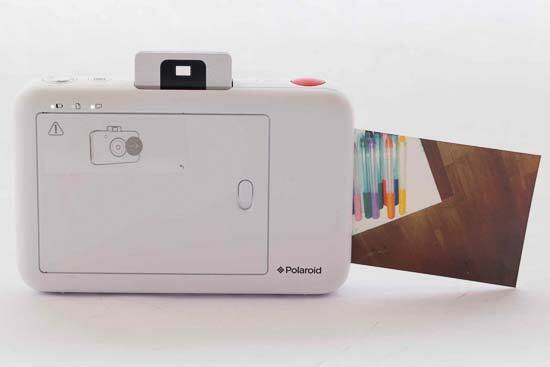 The new Polaroid Snap camera attempts to recapture the fun of instant photography, but with a modern, digital twist. The Polaroid Snap prints out 2x3 inch photos straightaway using ZINK (Zero Ink) technology, and can even store a back up of the photo you’ve just printed on a memory card. The ZINK paper also has an adhesive backing so you can also use each print as a sticker if you wish. You don’t however get a rear screen, or an electronic viewfinder. There’s also relatively few changes you can make to settings. 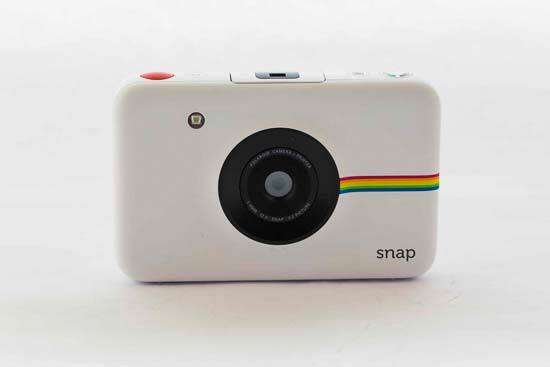 The Polaroid Snap is available in four different colours, with one of its unique selling points being a relatively low price (£89 in the UK). This cost doesn’t take into account the price of supplying it with the paper which you need to print your, er, prints though. 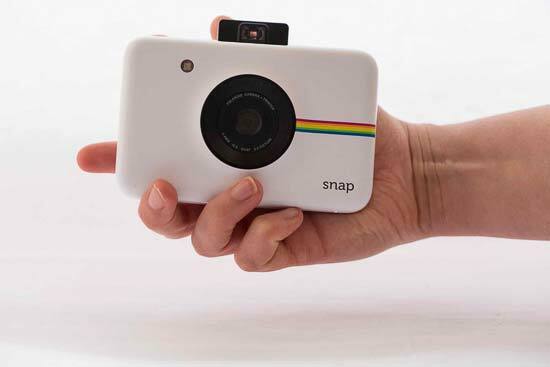 The Polaroid Snap has a 10 million pixel sensor, and a fixed length lens. It was designed by the Ammunition firm, which has made its name working with the likes of Beats by Dre, Square, Lyft and other big brands. It’s clear that Polaroid’s designers were keen to stick to a minimalist design with the Snap, with clean lines and rounded edges to give it a modern twist on an old style. What’s also clear is that the designers have spent some time thinking about how each element of the camera will function for the best user experience. This first becomes apparent with the magnetic lens cap, which handily snaps (see what they did there?) into place on the front of the Polaroid Snap. This has the dual effect of slotting very neatly and quickly back into place and making it harder for it fall off and be lost somewhere in a bag. To switch the camera on, you need to push down the pop up viewfinder - the camera should turn on automatically when you do this. During testing I found that a few times the camera seemed unresponsive and needed me to push the viewfinder back in and up a couple of times before it would switch on. Other times it would switch on after a couple of seconds. Yet other times still, it would switch on instantly. Since the hinge of the viewfinder is reasonably loose, it’s very easy to accidentally push it while it’s in your pocket, or for it to push against something when the Polaroid Snap is in a bag. Fortunately, the Snap has an automatic timer for switching off the camera when it hasn’t been in use for a few minutes, so the battery shouldn’t run down too easily. This viewfinder doesn’t have optics, nor is it electronic. It’s literally a hole through a piece of plastic. It’s billed as a “retro viewfinder” but its use is limited since it shows a much wider view than the lens actually reproduces. It takes some time to get used to how much space you need to allow without cutting off people’s heads or missing out landmarks, but it’s something you get used to with a little time and practice. To take a shot, you press the shutter release button. Sadly, it doesn’t have too much give to it, but there is a quiet beep sound made to let you know when an image has been taken. If you hold down the shutter release button for four seconds, it will take a series of four shots in a row, printing them all out on the same piece of paper. Or at least that’s the theory - my unit would only take two shots per print. Speaking of the battery, one of the Polaroid Snap’s benefits is a rechargeable battery - meaning you won’t be forking out for additional batteries when it runs out. It also charges using a standard MicroUSB cable, so even if you lose the supplied cable, you shouldn’t have much problem replacing it. Loading the Polaroid Snap with ZINK paper is a pretty easy process. Simply push down a switch to open hatch on the back of the camera. Here you can inset the ZINK packs of paper. The packs come up with a blue sheet of card which must be inserted into the camera along with the pack. You take a shot and the loading sheet will be ejected from the camera, you’re then free to take a shot as normal with rest of the prints. The camera will automatically print if there is paper loaded - it would have been nice if there was a way to make the printer shoot “digital only”. If there’s no paper loaded into the printer, you can still continue to shoot digitally only. Another problem is there’s no “shutter” count, or any indication of how many sheets of paper are left. When it runs out, a small red LED light on the back of the Polaroid Snap will turn red. It’s also worth noting that you can’t insert extra paper until it has run out - so for instance if there was just three sheets left and you wanted to make sure you could keep shooting. Each new pack requires you to go through the process of inserting and ejecting the blue piece of card before using new paper. 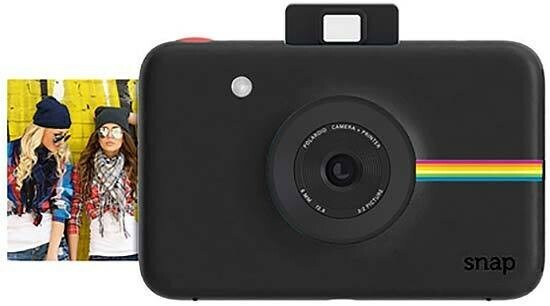 On the paper door of the Polaroid Snap is a sticker which reminds you to remove the lens cap - handy (if you notice it), as if you shoot with the lens cap on, but paper inserted, the camera will still print something - an all black sheet. Just above the paper door are three lights, one which indicates if there is any paper in the printer, one which indicates battery life, and another which indicates if the memory card is full. The lights will be a white colour when everything is fine, switching to red when the battery is about to die, or there’s no memory left. The middle light, which indicates paper levels, will flash when the printer is in use. You can still take a photo when the printer is printing, with the resulting image printing out once the first one has been ejected. Each photo takes roughly 30 seconds to print out. 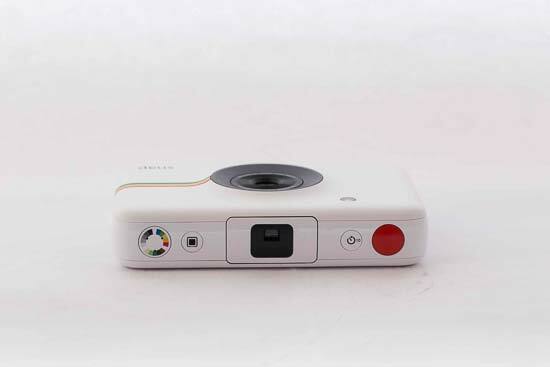 As previously mentioned, there’s not too much in the way of control afforded over shooting options for the Polaroid Snap, and that is reflected in the number of buttons on the camera. On the top of the camera you’ll find a shutter release button, a self-timer button, and two buttons for your “artistic options”. You can choose between a sepia shot, a full colour shot or a black and white image. The other button is for choosing whether to add the classic “Polaroid” frame on your print, or not. On the side of the Polaroid Snap you’ll find a slot for a Micro SD card and the port for plugging in the power charger. Despite the fact that the camera is saving shots to the memory card, there’s no way to print out a photo you’ve already taken - if you wanted two copies for instance. It would be nice if the camera could be connected to your phone or tablet via Wi-Fi to allow you to reprint shots.